In the world of effects, production follows the market. Lot’s of love goes out to those musicians who play the electric guitar. Lots of love in the form of 1,000s of pedals to tinker with and create. If I had to guess, I’d say that next up in the line is the bass player (who can use guitar pedals-BTW) with a good array of choices when it comes to pedals associated to their specific octave, tone and signal ‘noise’. After that it’s probably the folks tickling the ivories. But, somewhere on this chart are those who play the acoustic guitar. For the most part, these folks don’t use effects pedals the same way an electric guitarist does. Some do for sure, exploring the tidal forces of feedback that a wooden acoustic cavern has on the twisted waves of sound produced by effect boxes of various kinds. Instead, the stomps that acoustic players use are mostly to enhance the sound of the guitar. It’s an attempt to capture the natural essence of the instrument, to augment it in a way so that it can be transferred in the electronic medium without degradation or disdain. It is an acoustic guitar after all and it’s tones can sound foreign in the world of electronics. Well the Danes at TC Electronic have created yet another pedal to help our acoustic brethren reach simpatico with their electronic environs. 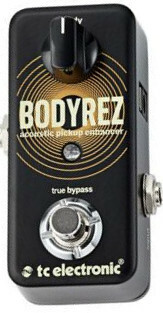 Their new pedal is called the BodyRez and it’s an acoustic pickup enhancer. According to their release, “BodyRez aims to enhance the sound and resonance of piezo-equipped electro-acoustics, removing the quacky, flat tone sometimes associated with these pickup systems.” I like the term quacky. I think that sums up the uneasy, typical, out-of-place electro-acoustic tone pretty well. And if the folks have come up with an affordable pedal to ease those tones into the background, then good on ’em. The BodyRez is really an easily adjusted filter and compression pedal that is specialized to work with acoustics so that the guitar sounds like it should: natural. The great thing is it does this all with one knob – which is always a benefit. Not everyone wants to be a musician and an engineer. The pedal also has a phase reversal to limit low-end feedback built in and a mute function for when you need to switch between your 1967 Gibson B25 and your 1903 Martin 0042. Because that happens from time to time.